The Johnson family reunion. Almost the whole gang. Johnson of Australia was a division of Johnson Brothers England, one of the largest producers of domestic pottery since the late 1890’s. Like the parent company, they made a huge range of tough domestic utility china, a product known as ‘semi-porcelain’. This range of earthenware had the characteristics of fine china but the durability of ironstone. During WW2 many potteries in the UK were closed down. Only export potteries were allowed to stay open. Exported china was very colourful and ornate and mostly to the US. 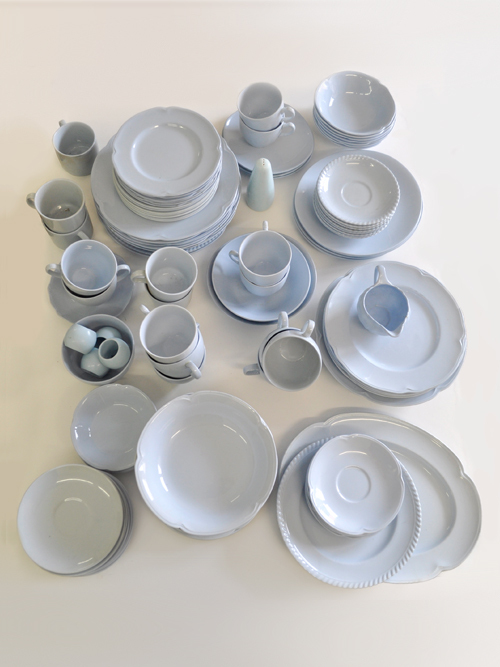 British families and war brides made do with plain simpler china in limited pastel shades of blue, yellow, pink and green. I love this stuff. Its so durable and clean looking, and there are some with fancier edges but still modern I think. You can put them in the dishwasher, they will eventually lose their glossy glaze but I’ve got a lot I still use that we have been using for years. Some of these might have a chip which I don’t mind too much, they are the same colour all the way through and quite often harmless. Luckily there’s still a few pieces around to be found, though not as many in recent years.